I am going to teach you how to make the best steak ever. And no, you won’t need a grill. The best steak is made on the stove top then finished in the oven. The key to making the best steak starts with the key to making the best anything: great ingredients. You can not make a truly good dish without good ingredients. It just isn’t possible. That being said, you’ll want to make sure you start this recipe with a nice piece of meat. The #1 thing I look at when buying meat is that it is antibiotic free. The second most important is that it is grass fed. The best steaks I buy come from our neighborhood butcher. If you can’t find grass-fed beef that was raised antibiotic free at your grocery store, I highly encourage you to seek out a butcher. You can also use a subscription service like Butcher Box. The second most important key to making the best steak recipe is using a cast iron skillet. A super hot skillet is the secret to making a nice crust on the steak. Hopefully, you already own one. If not, you can buy one for around $25 and it will last a lifetime. Everyone should have a cast iron skillet in their kitchen! The final key to making the best steak? Blue cheese butter. This can be whipped up in a jiffy and is melted on top of the steak at the end of cooking. Yum! Take your steak out from the fridge about 30 minutes before you want to cook it. Preheat oven to 400 degrees. Combine the parsley, garlic powder, and black pepper in a small bowl. This mixture is enough for 3-4 steaks, so apply accordingly to the amount of meat you are making.
. 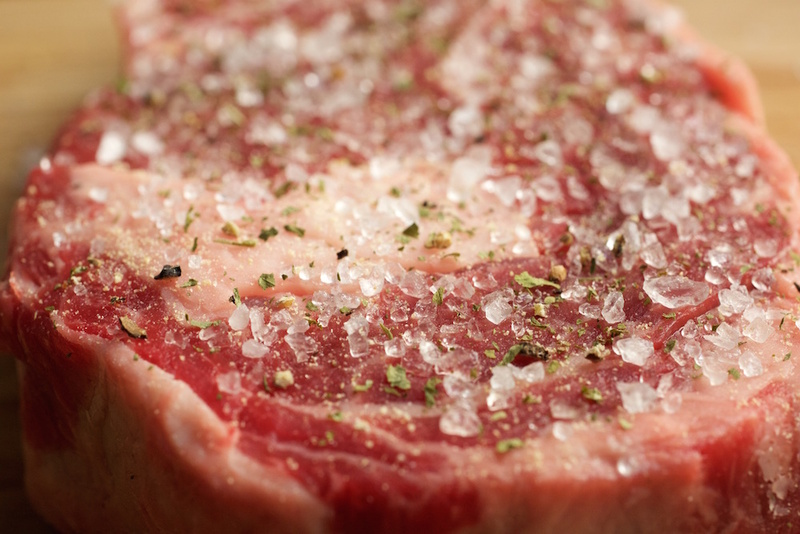 The salt is what is going to give our steak that delicious crust, so make sure the entire piece is covered. over medium-high heat for a few minutes. Once it is thoroughly heated, place the seasoned side of the steak face down in the pan. It is important not to move the steak after you place it, so it can form the crust. Quickly season the other side of the stake. Cook 5-7 minutes per side. Use a tong to brown all edges. After cooking each side, transfer the skillet to your preheated oven. Cook for about 6-12 minutes, until the desired doneness. Test with a meat thermometer to see how done it is. Medium-rare (135°) is the ideal temperature to bring out the flavor of the meat. If you like yours a little less pink, you could cook until it is Medium (145°). Of course, you could cook in even longer to medium-well or well, but why would you want to ruin a great piece of meat?? 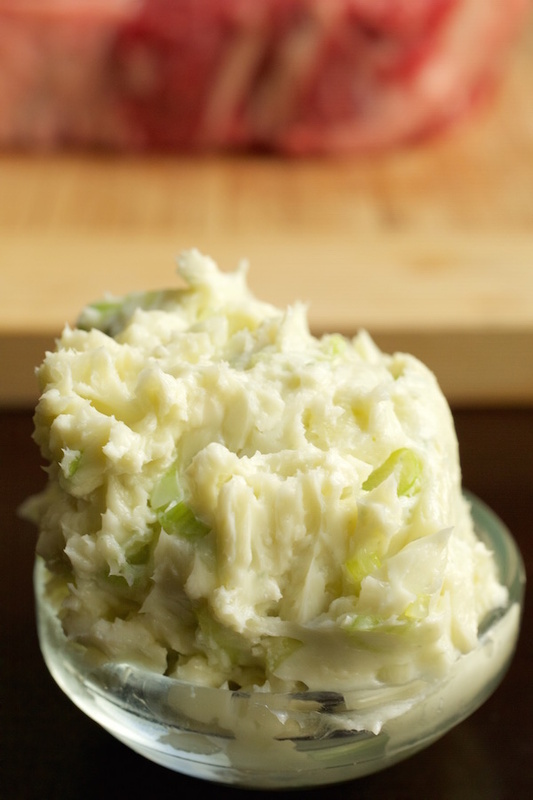 While the steak is finishing in the oven, you should be making the steak butter. Mix together the butter, crumbled blue cheese, and scallions. Add salt to taste. When steak is at the desired temperature, move to a plate. Cover steak with 1 tablespoon of the blue cheese butter, then cover with aluminum foil for 10 minutes (temperature will rise 5-10°, so keep that in mind). This is important because it allows the meat to “rest” and soak in all of its own juices. When finished, slice against the grain and serve! Feel free to use the remaining steak butter. 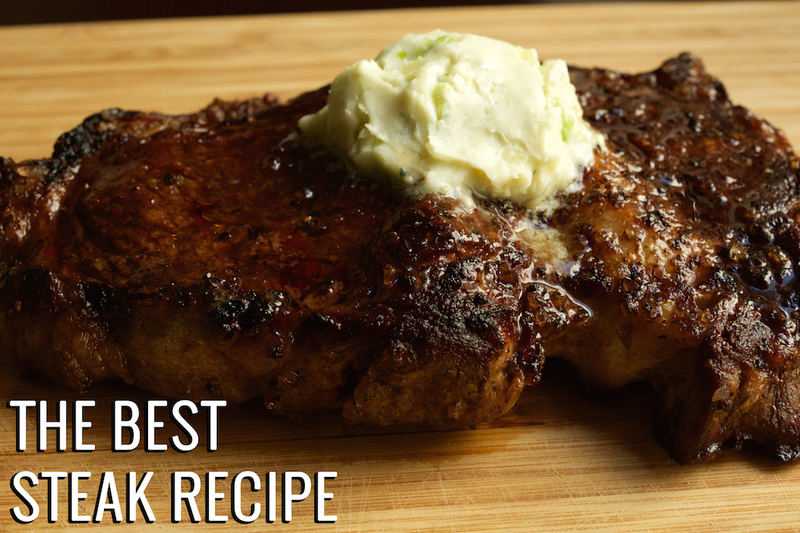 I definitely need to try this recipe out to establish whether it is “the best” steak – but is sure does look mouthwateringly delicious! This looks like something that should be served in a restaurant!! It was too salty. I thought the salt will create a crispy crust which I can remove later, but the salt was just absorbed to the steak. I would adjust the amount of salt later. It sounds like your skillet wasn’t hot enough. At the right temperature it will create a crispy crust. I was concerned about the salt too…but it allowed for a great coating. I used an iron skillet with butter heated very high before I added my steaks. The steaks were perfect! We’re not fans of blue cheese…so I did a garlic butter instead. Extremely tender. Definitely my new go-to recipe for our steak dinners. I made this tonight and it was the most delicious steak I have ever had. I will never cook steak any other way again. Thanks. Thanks for this Jessica. I concur about getting the best possible quality grass-fed, antibiotic-free steak. We’re a steak loving family I will definitely try this method. I usually grill our steaks though. Our normal process is to marinate the steaks for a few hours before grilling in Worcestershire sauce and perhaps some salt and pepper or steak seasoning with garlic. Another trick I picked up is to marinate in Italian salad dressing. The results can be amazing! BTW, what are your favored cuts for steak? Top quality Prime is what we usually go with, but the cuts can vary. We tend towards nicely marbled T-bones or NY Strip though. I grew up with grilled steak and that’s what I always had until this method. After searing then finishing in the oven, I haven’t even grilled a single one! Your marinade sounds great. We usually get a porterhouse or ribeye, but there’s not really a cut I’d turn down! Please let us know how you liked this recipe after you try it. Hoping you’ll love it! I did this not long ago and I absolutely loved it! My mom and GF said it was best steak they’ve had! Glad your family enjoyed it, Jake! Just made this for lunch . It really is the best steak I ever had ! Is there a way to do this without a cast iron skillet? You need the cast iron skillet to get the sear. The only other way would be with a tool like the Searzall Torch Attachment. It would be much more cost-effective to buy a $25 cast iron skillet. How thick are these steaks? Have you ever tried coating with coffee grounds? I had a steak a few years ago called kona steak, and it was the most delicious I had ever had…the coffee along with other seasonings created the crust…looking for a little healthier way to create a great steak. The butter of course makes anything taste better…not necessarily the best on the waistline. I’m going to try this for entertaining purposes as it does sound delish…just wondering if you’ve tried coffee to make a crust on steaks. My family would really enjoy this! I am not that crazy about stea. An occasional one is okay with me ; BUT !!! I tried this recipe and guess what ? I reduced the salt and my steak was awesome ! I don’t have an iron skillet. What would your recommendation be to get similar results? You can use a regular non-stick skillet, but you will not get the same crispy sear. I would highly recommend buying a cast iron skillet. You can get one for around $25 and it will literally last a lifetime. I have made this recipe for my husband for every major holiday (New Years, Valentine’s, Birthday, 4th of July) this past year. It is his absolute favorite and makes me feel like a pro in the kitchen. Thanks for sharing. I always love a good steak but I would like to help everyone out by saying that all meat that is on the shelf is antibiotic free. As a dairy producer and meat producer, it is illegal for me to sell meat or milk that has any… any drop of antibiotic residue. I have a great veterinarian relationship and have been set by strict protocols as to when I can give medicine and how long the animal has to stay in my care until the antibiotic has left their system. Please be advised that many of the antibiotic marketing is just a gimmick to get you to buy that piece of meat. All of it on the shelf is free of antibiotics. Side note, love the recipe! 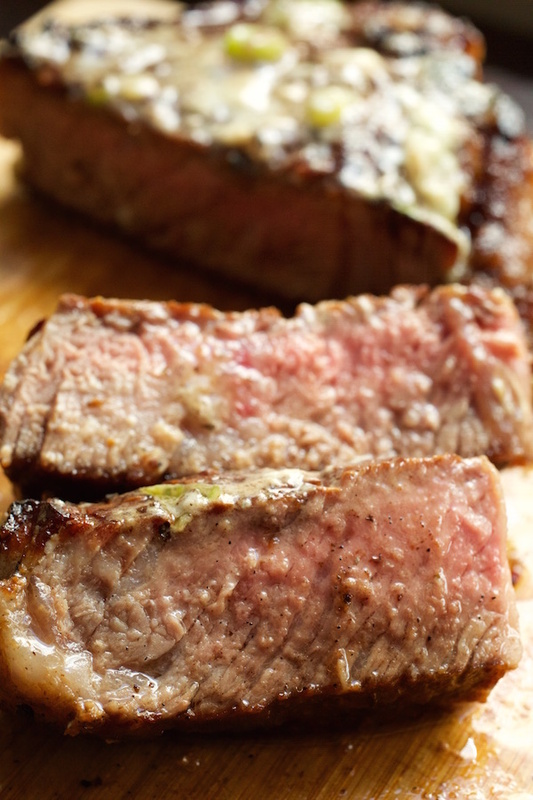 We LOVE this steak recipe! We make it a few times a month with really thick cut, grassfed ribeyes. Amazing! I followed your recipe pretty closely, and the steaks turned out AMAZING!! I used top sirloin angus beef. Thanks for sharing your recipe!